(L-R): Dr. Leonard K. Peters, Kentucky Energy and Environment Cabinet secretary; Alle Barber (with Paula the penguin), WAVE Foundation at Newport Aquarium program conservation manager; Eric Rose, Newport Aquarium executive director; Halida Hatic, Center for Interfaith Relation director of community relations and keynote speaker; Steve Coleman, Kentucky Environmental Quality Commission chairman. 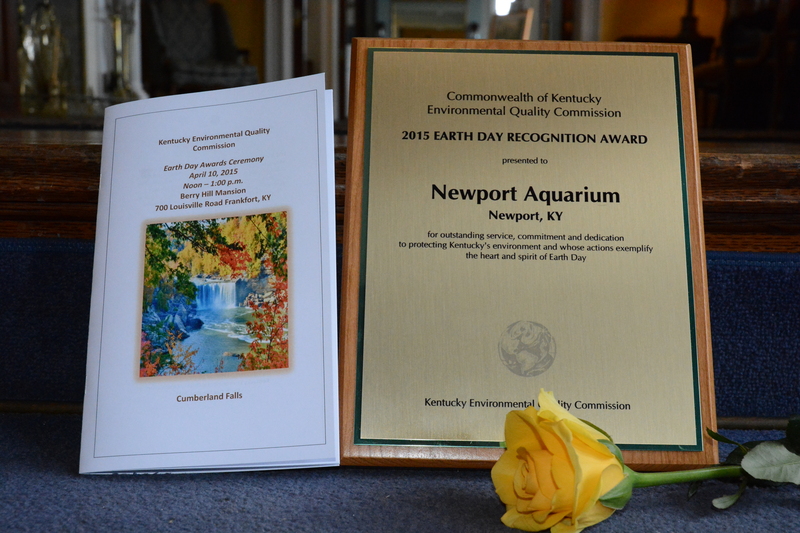 FRANKFORT, Ky. — Newport Aquarium received accolades Friday from the Kentucky Environmental Quality Commission for its environmental conservation efforts during the annual Earth Day Awards ceremony at Berry Hill Mansion. Earth Day Awards from the EQC recognize individuals and organizations for their extraordinary efforts to enhance and improve environmental quality. Newport Aquarium was praised for promoting a “Water Story” throughout its exhibits with the goal of educating its guests about the importance of water conservation throughout the world. 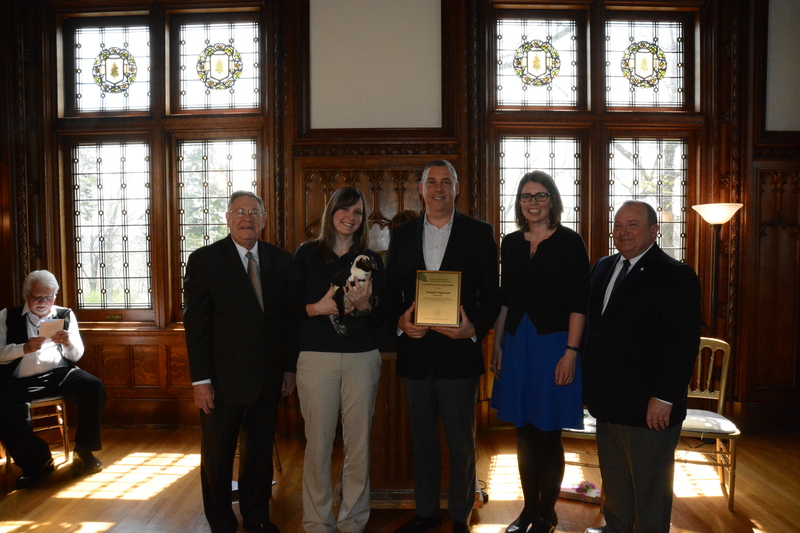 EQC Chairman Steve Coleman presented the award to Rose, along with Paula the African penguin. “EQC is very proud to recognize the contributions of the Newport Aquarium in raising awareness on the importance of our water resources and getting citizens involved in environmental stewardship,” said Coleman. Kentucky state Rep. Dennis Keene attended the ceremony in support of Newport Aquarium, the largest tourist attraction in his district in Campbell County. 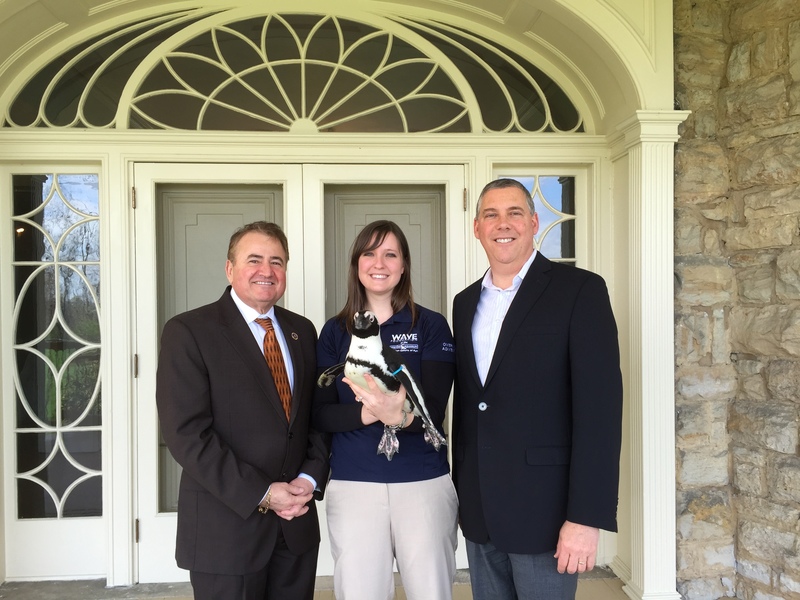 (L-R): Kentucky state Rep. Dennis Keene; WAVE Foundation at Newport Aquarium Program Conservation Manager Alle Barber (with Paula the penguin); Newport Aquarium Executive Director Eric Rose. EQC is a seven-member citizen advisory board created under Kentucky state law in 1972. Its mission is to facilitate public dialog on issues, monitor trends and conditions, promote partnerships to improve and protect the environment for future generations. EQC also advises state officials on environmental matters and promotes public awareness, responsibility and positive action toward a healthy environment. This entry was posted in Penguins and tagged African penguins, conservation, Kentucky, newport aquarium, Water Quality by NewportAquarium. Bookmark the permalink.